Here at Conwy Water Gardens you will be able to find all the aquatic equipment & accessories you require, if its not in stock we will do our best to get it for you as soon as possible. 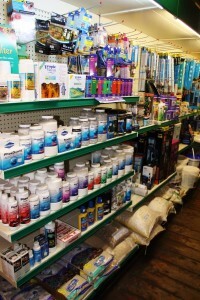 We stock all the well known brands like Tetra, TMC, Fluval, Seachem, API,Ehiem, Aqua One, Juwel, Ocean Nutrition, Aquaone, Red Sea, biOrb, Arcadia, Gamma frozen foods, Kb, Hikari, Dennerle, Kessil so it’s very likely we will have what you are looking for. We are official Juwel stockists and as such we stock the full range of accessories & aquariums so if you need T5 or LED lights, filter media, pumps, filters or back- grounds we have it. We offer Juwel aquariums at very good prices, if you find a lower price we will match it (t&c’s apply). We stock a wide range of frozen and live fish foods, with bulk discounts available when you buy 5 or more packets. We can now deliver Aquariums to anywhere in north Wales.